IronGate is proud to confirm that we will be participating in InfoComm 2012 alongside Aten and BlackMagic Design, two vendor partners from the 2012 IronGate AV Standing Offer (as issued by the Government of Canada / PWGSC). You will find us in Las Vegas between June 12th-15th, 2012 - please stop by or request an appointment for a private meeting. Having realized much personal and professional growth since joining the Ottawa Chapter of Entrepreneurs’ Organization, Sean Costello (founder and president of IronGate) is proud to announce that he was asked and has sine agreed to lead the communications and community outreach efforts for his local Chapter of EO through the organizations fiscal year 2013 (July 1st - June 30th). With great thanks to outgoing 2012 Communications Chair, Chuck Shabsove of Capital Appliance & BBQ for his efforts in the past year, Sean will be working with the rest of the incoming board to ensure a smooth transition. The Entrepreneurs’ Organization (EO) is a global business network of 8,000+ business owners in 121 chapters and 40 countries. Founded in 1987 by a group of young entrepreneurs, EO enables small and large business owners to learn from each other, leading to greater business success and an enriched personal life. Our vision is to build the world’s most influential entrepreneur community, which aligns with our mission of supporting entrepreneurial education and engaging entrepreneurs to learn and grow. This year, EO is celebrating its 25th Anniversary with events around the world, which will highlight the growth of our entrepreneur network and its role in the lives of members everywhere. As a global business owner network and association, we help transform the lives of the entrepreneurs who transform the world. We educate, we transform, we inspire and we offer invaluable resources in the form of events, leadership-development programs, an online entrepreneur forum, and business owner education opportunities, among other resources designed for business growth. Remembering with pride our role as founding sponsors of the very first LightSpeed CertCamp, it is with great joy that we are poised and ready to attend the 10th such camp, which will be held in San Francisco, March 31 - April 2nd, 2011. While attending, Sean will be announcing updates to the IronGate discounted service offering for LightSpeed Resellers, in addition to sharing exciting news from Background Backup Inc., the business-class, managed data protection service which has recently been spun off from IronGate after three years of development and preparation. As a part of Apple Connect 2011 (a weeklong professional development training event, held in Markham, ON), Sean Costello of IronGate Server Management & Consulting will be co-hosting the Apple Consultants Network (ACN) Meet ‘n Mingle event on Wednesday, March 16th 2011. The goal for the evening is to help introduce the 125 camp attendees, as well as the senior Apple Engineering and Sales teams, to the knowledge, expertise and capabilities of our active group of Canadian ACNs. In support of the event, a booklet was produced which includes brief bios and service examples, for each of the featured Apple-certified Consultants. Head on over to www.meettheconsultants.com to grab a PDF of the booklet, or to grab the vcards from all the hosts and presenters. In conjunction with MacWorld week, Sean Costello and Chris Lafleur Bell are headed out on the road for a week of learning, teaching, sharing and networking. 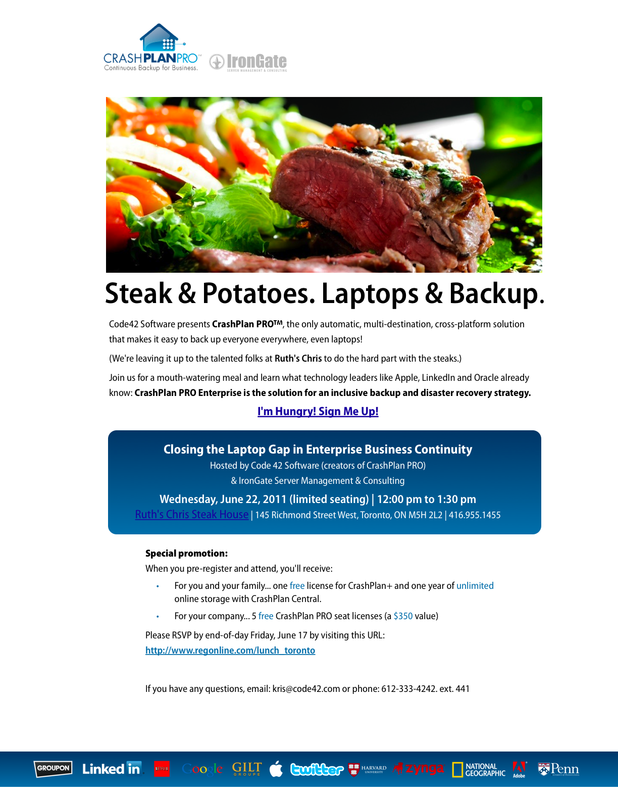 - A series of product and service seminars at Simply Computing, a Vancouver-based Background Backup reseller. We’re looking forward to a good time, and encourage you to track us down and say “Hi!” along the way. In order to accommodate the anticipated growth of Background Backup in 2011, the system administrators are going to be taking advantage of the low impact period between Christmas and New Years to migrate the master and slave servers onto larger, more robust versions of the Linux-based Background Backup appliances. • The scheduled maintenance activities will only impact the offsite Background Backup servers, and will not affect the performance, use or readiness of any onsite backup destinations or appliances. • In order to conduct the strongest possible maintenance validation and data integrity tests, no new users are permitted to be added to Background Backup on either the 24th, 25th or 26th of December, 2010. • No changes whatsoever are being made to any of the Background Backup service urls and links, versions of software being used, or the features and settings available for use. • Toll-free, 1:1 phone and email support will be available, in case any urgent situations arise at any time during the maintenance window. If you have questions about the planned maintenance, please email (using your registered email address) us at support@backgroundbackup.ca. Urgent requests can also be called in, to 1-800-BUNKER1. • Acquire and burn-in new servers and storage (this is already underway; servers have been onsite and running in a parallel test configuration since October). • Prior to Dec 24th, copy (rsync) an initial set of encrypted backup archives to the new appliances, while all services remain live; there will be no interruption of service whatsoever during this phase, for all users and all destinations. • Beginning at 6:00 PM (all times Eastern), December 24th, rolling “offsite destination” service outages will occur as groups of users (approx. 100 per group) have backups to their offsite destination stopped in order to perform clean, static synchronization of their up-to-the-minute archives. During this phase, users checking the CrashPlan application will continue to see a green icon to the left of the IronGate StrongBox destination in their CrashPlan application, however the status message to the right will eventually switch to “Destination unavailable”, as your group migrates. • After all user archives have been cloned to the new appliances, we will bring down the existing master server, and bring up the new master server. This is likely to occur in the early afternoon of December 26th, but will occur earlier if the migration completes sooner than anticipated. During this phase the green icon beside the offsite destination will turn grey, but other appliance-based or local destinations will remain green and active. • Once the performance of the new servers has been certified and verified to our satisfaction (likely less than 30 minutes), all client installations should auto-detect the new master server, and immediately begin secure communications. Within CrashPlan, users will see the destination status dot turn green. • As the client agents auto-discover the new servers, a synchronization task will begin, ensuring that all client archive caches on each protected machine match the actual offsite archive. • During this synchronization process, it may look like the client is re-uploading a significant amount of data; be assured that it is merely stepping through the files and performing a thorough analysis, and that any data previously uploaded should not require actual re-transmission. • Through the morning of December 31st, users may experience one or more brief periods of offsite-destination service unavailability, as the final aspects to configuration and turn-up are performed, before the servers are released for service.